Increasing the retirement age is a substantial benefit cut for all retirees, and penalizes low wage workers disproportionately. The President’s Fiscal Commission (the “Deficit Commission”) recently joined the chorus of public figures calling for cuts in Social Security benefits. The commission did this partly in the guise of tying increases in the retirement age to increases in longevity. This seems at first like a reasonable approach: as we live longer, perhaps we should be expected to work longer. 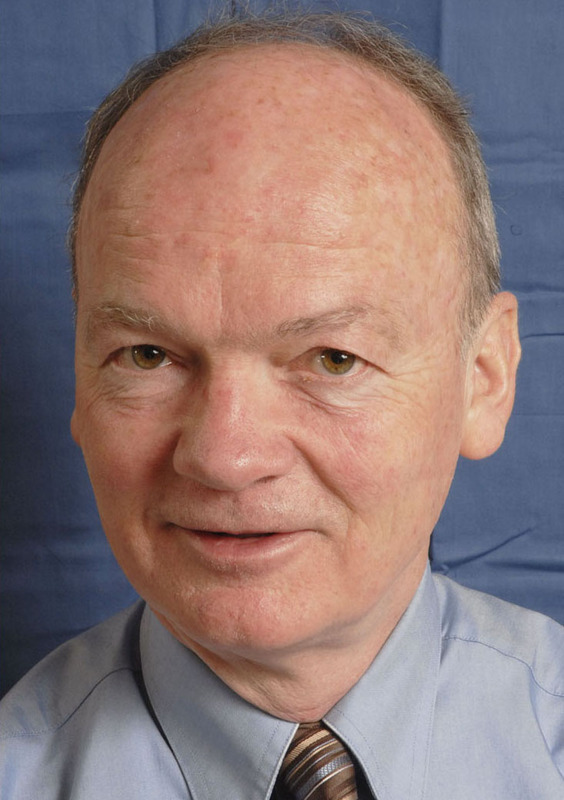 What is not well-understood, however, is that an increase in the full benefit retirement age is a benefit cut for all future retirees, regardless of when they retire. Furthermore, increases in longevity are likely to be felt very unequally. The net result could be lower retirement income and fewer years spent in retirement for low wage workers retiring in the latter half of this century. The table below shows how Social security benefits depend on the age at which you retire. Under current law, those born in 1960 or later will receive full benefits (100.0 in the table) if they retire at their full retirement age of 67. Those retiring sooner receive less (for the rest of their lives) and those retiring later receive more, up to age 70. 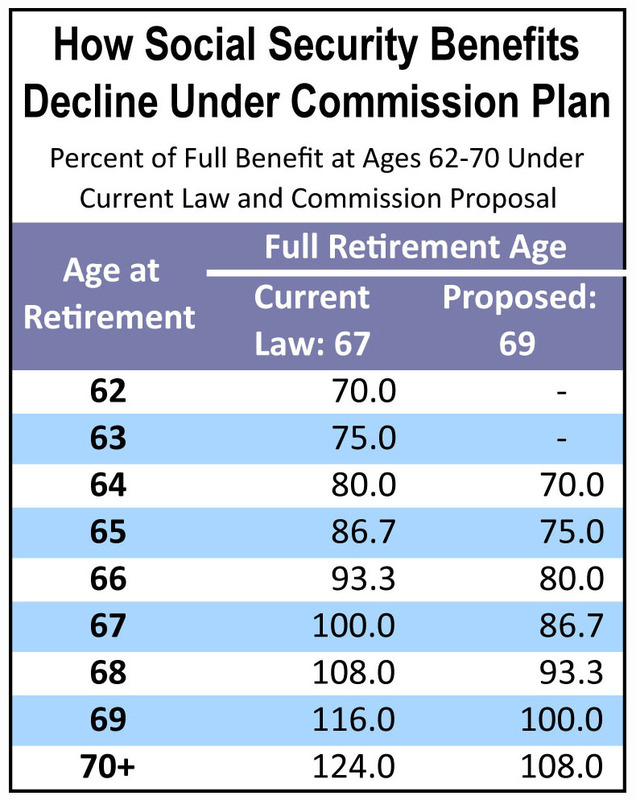 If the full benefit retirement age is increased to 69, as the commission chairs propose (others have suggested raising it to 70), then all retirees from that point on receive about 13 percent less in benefits, every year, than they would have under current law. Those who wanted to retire at 62 or 63 would no longer be eligible for any Social Security benefit. Those wanting to retire at 66 (the full age for the baby boomers retiring now) would get 80 percent of the full benefit instead of 93.3 percent. The Commission and others who argue that increased life expectancy is a major contributor to the projected shortfall in Social Security revenue in 2037 or thereabouts ignore an important trend. Life expectancy at retirement has become very unequally distributed. Those born in 1912 who reached age 65 in 1977 could expect to live about another 15 years. For those born in 1960, it depends on how well off you are. Those with earnings above the median can expect to live another 22 years in retirement. But those with earnings below the median have a life expectancy beyond age 65 of just 17 years. (See Dean Baker and David Rosnick, The Impact of Income Distribution on the Length of Retirement, Center for Economic Policy Research, at http://www.cepr.net/index.php/publications/reports/impact-of-income-distribution-on-retirement-length ). If the increasing inequality in longevity continues and the retirement age is raised to 69 or 70, a lower wage worker born in 1973 and retiring at 69 or 70 could actually expect to enjoy retirement for fewer years than his or her grandfather who retired at the full retirement age of 65 in the mid-1970s. In actuality, no benefit cuts of any kind are needed to guarantee payment of full Social Security benefits for the rest of this century. Modest increases in the earnings threshold and the payroll tax are sufficient. Increasing the retirement age is a substantial benefit cut for all retirees, and penalizes low wage workers disproportionately. The proposed new rules would work fine for me and my husband (61 and 56 yrs. ), since his family lives a long time on both sides and we are both bicyclists and healthy, but manual laborers tend to decline about seven years sooner. I’ve met many who are no longer able to work yet have trouble getting disability. This wouldn’t work for them.